Oh how I love Pinterest. Without it I may never have found these amazing 4th of July candy bars that Jana created or her amazing blog Cherry Tea Cakes. 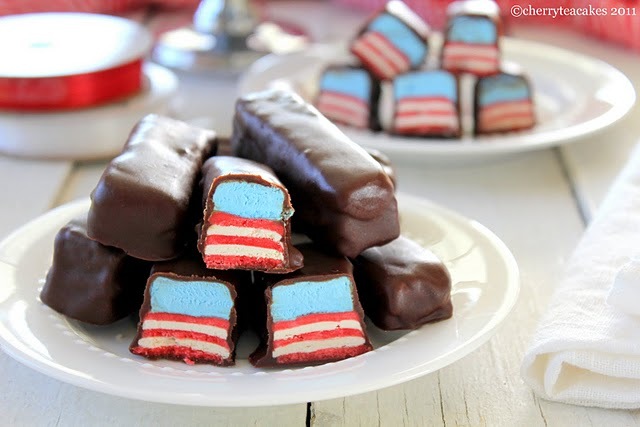 If you have it in you to throw together this amazing treat last minute, you can get the recipe for these red white and blue candy bars HERE. And if you aren't in a candy bar making mood, but are looking for some fun new ice cream flavors to try this summer, Jana has quite a few that you might want to try. Everything from a delicious peanut butter to a unique strawberry and black pepper. You can check them all out HERE. how clever! kids will love it!